Nere has never understood why she is so much more comfortable and confident in the water than on land until the day she learns the shocking truth—she is one of a group of kids who have been genetically altered to survive in the ocean. These products of the "Neptune Project" are supposed to build a better future under the waves, safe from the terrible famines and wars and that rock the surface world. But there are some big challenges ahead of her: no one ever asked Nere if she wanted to be part of a science experiment; the other Neptune kids aren't exactly the friendliest bunch, and in order to reach the safe haven of the new Neptune colony, Nere and her companions must swim across hundreds of miles of dangerous ocean, relying on their wits, their loyal dolphins and one another to evade terrifying undersea creatures and a government that will stop at nothing to capture the Neptune kids ... dead or alive. Fierce battles and daring escapes abound as Nere and her friends race to safety in this action-packed marine adventure. "This is an enjoyable book, with lots of adventure, suspense, and underwater scenes. The novel hits the target audience right between the eyes on 'hot button' issues, especially global warming and its consequences, but should be popular with readers who are looking for a slightly different dystopian adventure or those who just dream of living in the ocean and playing with dolphins." "Holyoke keeps her prose well-pitched to her audience, providing enough violence and even death to create suspense but muting it appropriately. She creates an interesting and diverse set of characters, including the dolphins. The science-fiction elements are nothing new, but they are built on good information about oceanography. This suspenseful, undersea dystopia should keep middle schoolers hooked." "Almost every chapter ends with a cliff-hanger, forcing the reader to flip the page for more. In addition, the book revels in the beauty of the underwater world and the creatures that inhabit it. The relationship between the teenagers and the dolphins—who actually become characters themselves—is especially well crafted. There is even a touch of romance when Nere becomes the object of a romantic rivalry between two boys—quiet, reliable Tobin and sarcastic, daring Dai. With both romance and adventure, The Neptune Project will attract male and female readers." "Here is a dystopian novel with a neat underwater twist...the adventure element is a real draw. That Nere can experience regular kid situations throughout all of this—friend issues, parental problems—makes the story relatable, even if her best pals are (totally terrific) dolphins." "This fast-paced science fiction adventure with well-developed characters offers a vivid and exciting oceanic setting complete with villains, dangerous sea creatures, and protective dolphin friends." The Neptune Project was chosen for the Children's Book Council Seasonal Showcase, "Summer is for Exploring!" To get my active, outdoorsy 9 year old that excited about a book is a parental joy of the highest order..."
"A couple of my daughter's friends are... loving your book. Today, my daughter and her friend were swimming in the pool, playing The Neptune Project. This is the second time this week this game has been played in our pool! Congrats on writing a story that kids are reading and playing with too!" "Dear Ms. Holyoke, I loved your book The Neptune Project. I could not stop reading it! It has become my favorite book. Please make a second book! I am dying to find out what happens to Dai and the undersea gang, what happens in the colony, and the other adventures the Neptune Project kids will have." I just finished your book The Neptune Project! It is the best book ever!!! I loved it! I read it twice in four days I liked it so much. I really hope you write another one, because I still have so many unanswered questions. I really liked how you described the characters too. I became very attached to all of them as well... 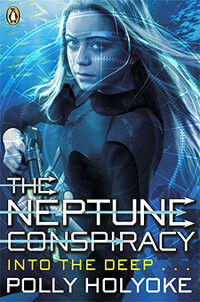 Sincerely, Britt"
"The Neptune Project was such a fun, fantastic middle-grade read! Holyoke as crafted a truly original and unique dystopian/sci-world and has done so wonderfully. 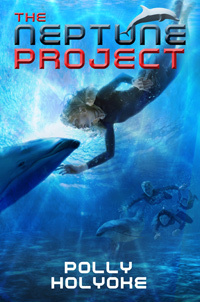 With superb underwater world-building, an exciting plot, and great characters, The Neptune Project is sure to please readers of all ages."